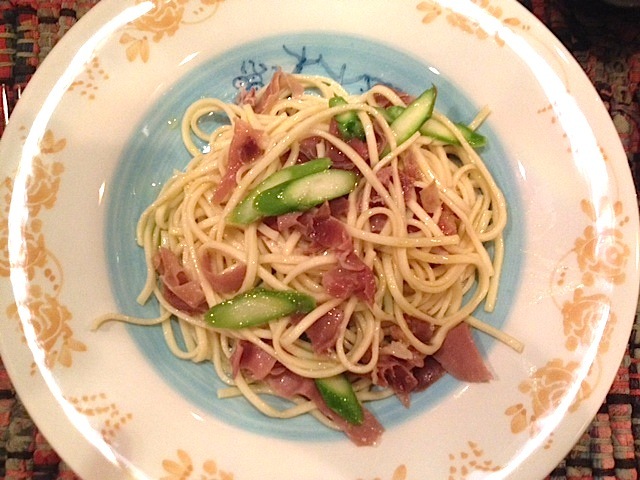 The perfect way to celebrate the mild weather today was serving pasta with two springtime ingredients – asparagus and prosciutto – for dinner. The pink and green in this dish signaled the upcoming change in seasons. To prepare this dinner for two, thinly slice five asparagus spears on an angle and cut five prosciutto slices into strips. 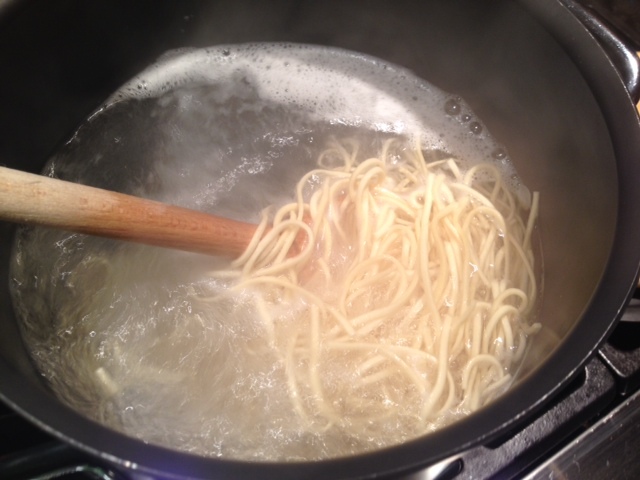 Bring a large pot of water to a boil and add a pinch of salt when the water comes to a rolling boil. I used egg spaghetti that cooks in six minutes, so as soon as I put the pasta in the water, I melted several tablespoons of butter and extra virgin olive oil in a large non-stick pan. I added the asparagus and prosciutto to the bubbling butter and oil and stirred while sautéing. Depending on the pasta you choose, you may want to start sautéing the asparagus and prosciutto later to prevent overcooking it. When the pasta is ready, transfer it to the pan, adding several tablespoons of the pasta water and more butter if necessary. 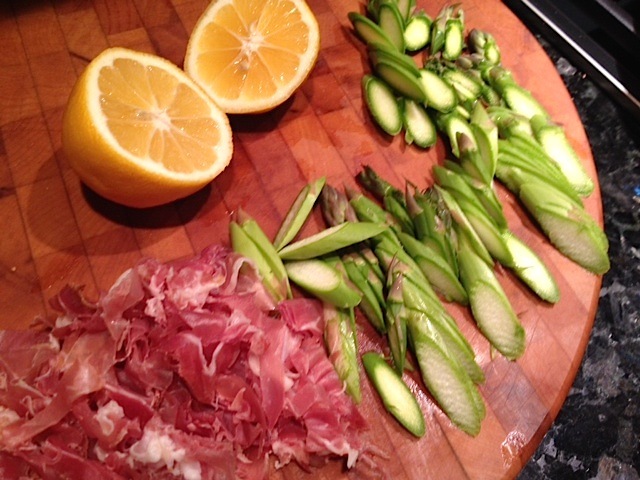 Stir the asparagus and prosciutto into the spaghetti, and add freshly squeezed Meyer lemon juice. Serve with some fresh cracked pepper and grated Parmesan cheese. This entry was posted in Uncategorized and tagged Asparagus, Butter, Cooking, Food, Meyer lemon, Pasta, Prosciutto, Recipe, Spaghetti, Spring. Bookmark the permalink. Thanks, Greg…glad you enjoyed the pasta recipe! Meyer lemons are a favorite, so I try to incorporate them as much as possible. I’ll check out some of your food adventures on your blog.